The Laing’s current Paul Nash exhibition, touring from Tate, is a unique opportunity to see Nash’s masterpiece in the context of paintings from the whole of his career. This is the only exhibition venue to include the picture, as it became available for loan only just before our showing of the exhibition. The Battle of Britain is on show beside Totes Meer (Dead Sea), another large painting from the Second World War. 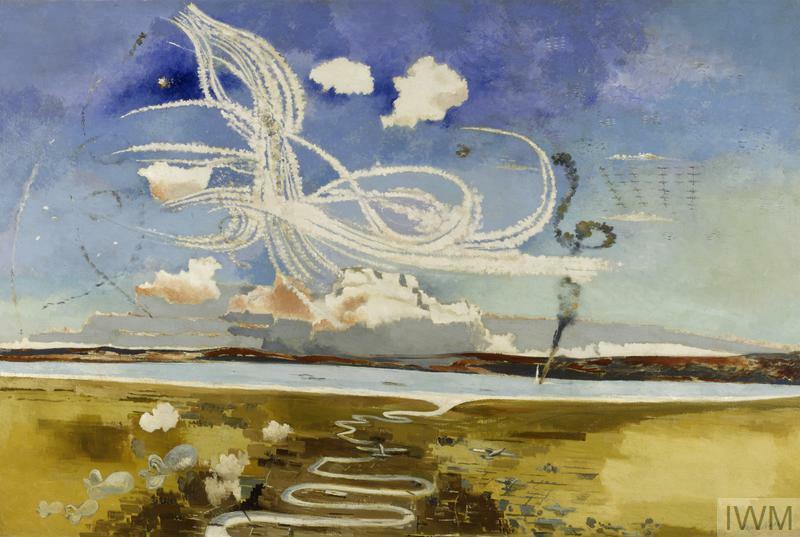 Nash had been fascinated by aeroplanes and flight since childhood, and he was commissioned by the War Artists Advisory Commission to paint a series of large pictures on the theme of aerial combat. Totes Meer was inspired by the huge dump of crashed planes awaiting recycling at Cowley, near Oxford, where Nash was living at this time. A third picture from this period, The Battle of Germany, a more abstract composition, is also in the exhibition. The trio make a fascinating comparison of different strands in Nash’s artistic range. During the war, attacks from the air became an increasing threat. 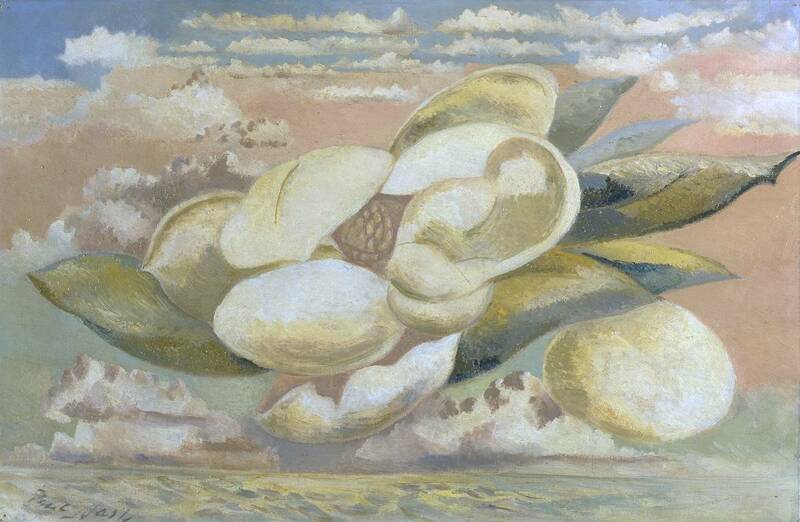 Nash described how he scanned the skies for parachute raids: “I strained my eyes always to see that dreadful miracle of the sky blossoming with these floating flowers.” This idea was one element behind his picture Flight of the Magnolia, painted in 1944, in the later stages of the war. In a complex piece of imagery, Nash added features inspired by seeing a magnolia blossom and an unusual cloud during a visit to a friend. The picture was linked to Nash’s own feelings of mortality. He went on to say, “death, I believe, is the only solution to this problem of how to be able to fly”. Nash was in very poor health at the time, and he died two years later from heart failure resulting from his severe asthma. Introductory talks are available for groups – to check availability and cost for your group, please contact info@laingartgallery.org.uk. Special rates are available for further education groups. 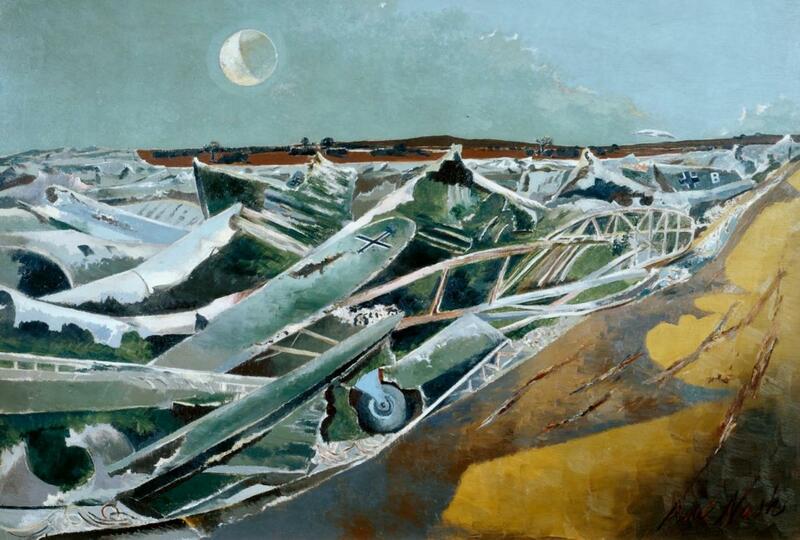 A previous blog looks at Paul Nash’s experiences as an Official War Artist in the First World War. A second blog, Paul Nash, a Romantic Surrealist explores the important surrealist strand of his art. The Paul Nash Exhibition Guidebook £24.99 is available from the Laing Art Gallery shop and online. The exhibition is organised by Tate Britain in association with the Laing Art Gallery and the Sainsbury Centre for Visual Arts. Thanks for sharing us the amazing Masterpiece collection of war.